Rich in Antioxidants These include caffeine, theobromine, tannins, saponins and catechins. Reduce Fatigue and Improve Focus. 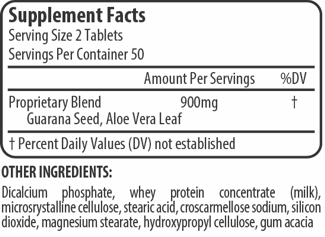 Calms your appetite and promotse weight loss. Guarana continues to receive acclaim in the health food market as a natural herbal energizer of the first rank. 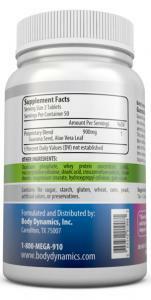 The lightly roasted guarana seeds imported from South America by Body Dynamics have a well-noted ability to help overcome fatigue. * Guarana is indigenous to Brazil and Uruguay, where it had been revered for centuries by tribes along the Amazon because it promotes greater mental alertness and increased physical stamina. * Brazilian miners drink a tea made from guarana seeds as a daily practice. Guarana is also the basis for a popular soft drink in Brazil. Guarana provides energy in a safe, organic way for times when an extra boost is necessary. It contains the naturally occurring stimulant, guaranine, an alkaloid similar to caffeine in molecular structure. 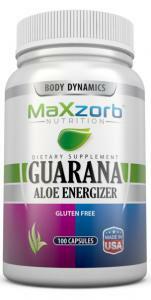 No other caffeine is added to our all-natural Guarana Energizer, which is free of any artificial processing. Aloe Vera soothes stomach irritation and heals internal organs and tissues. It acts as a cathartic, cleansing the intestines of undigested food particles and mucous. 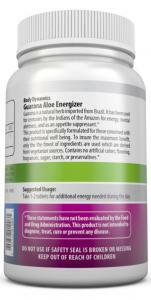 * Excessive consumption of guarana is not recommended, of course, but when that dramatic surge of energy, endurance and vitality is called for, Guarana Aloe Energizer is here to make the difference, naturally, from Body Dynamics.